Me, My Purse & The Boys: One Million!! 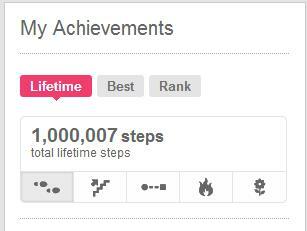 This morning I passed one million steps counted on my fitbit. I likely could have met this milestone awhile back, but I lost the darn thing. Whatever...I'm thrilled to get to that mark and look forward to getting 2 million steps counted. I've changed my goal, to 15,108 steps a day. An odd number - but after adjusting for my stride length - that's how many I need to get 6.2 miles in a day. Today I'm happy to announce that I'm going past that. I've been chasing my daughter all day. Trying to stay number 2 on my friends list. Working on #1 - but Jeffery has some long runs in and it's going to take some work to catch up with him! Add me if you use fitbit!